We are an awarded HVAC dealer of choice for the Greater Toronto Area with many years of experience in installation and service of furnaces, air conditioning systems, water heaters, water filtration, insulation and more. One of the many reasons our customers recommend CHC is that we look after your rebates for you, with our experience we get you the rebates to reduce the cost of purchase. We also have 0% financing plans for you when you qualify. Constant Home Comfort Group is a leading home energy construction employees efficiency improvement company operating in Toronto & Vancouver. Our agenda is to provide high quality and affordable products and services that are installed, repaired and/or replaced by a professional technician in a timely manner. Our expert service technicians are more than highly qualified and even more knowledgeable to provide you with the most appropriate solutions for all your cooling and heating as well as duct cleaning, window and door replacement and insulation needs in Toronto & Vancouver. They can evaluate the comfort of your home or office and provide you with the best solution that not only guarantees satisfaction, but is the right fit for your needs as well. Today’s modern technology ultimately means that almost any home or building can be comfortable during brutal winters and hot humid summers. Our sales staff try to sell you affordable energy saving equipment, which includes furnaces, air conditioning systems and water filters. Constant Home Comfort is a Lennox Centurian award winner in recognition of outstanding dealer performance. The award is given to approximately 2% of the top performing Lennox dealers in North America. This exclusive club is one more confirmation that when you choose to buy Lennox from Constant Home Comfort in Ontario, you are given a dealer that has buying power and say with Lennox to ensure you get the best available price along with the expertise and service you want. Looking to buy a new furnace or air conditioner? need information about HVAC rebates in Ontario? We are customer focus: Our sales staff and team leaders ensure that everything we do provides value to our customers. Our focus is on what our customers requires and figure out the best solution to assist our customers in maximizing savings and comfort. We sell top Notch Products: We install top-notch energy efficient products that are guaranteed to last you for a lifetime, if the equipment is maintained in good condition. When we come to install your furnace or air conditioner in your Toronto home or building, we will provide you with advice on how to best maximize your comfort and savings. Trust: Being in the industry for over 10 years has allowed us to build strong relationships with our customers and many residents in Toronto. Contact us today to book your initial consultation. We will come directly to your home and take the hassle-free process from there. We look forward to working with you. Our service technicians are highly qualified and extremely knowledgeable. They want to find the best solution for your heating and cooling needs. Being in the HVAC industry for over 10 years, we have established strong relationships with our clients and many neighbourhoods in Toronto. You can visit our Google+ Page, BBB or Homestars to see what our satisfied clients have to say about us. Constant Home Comfort is one of the largest air quality and home comfort product providers in Ontario. 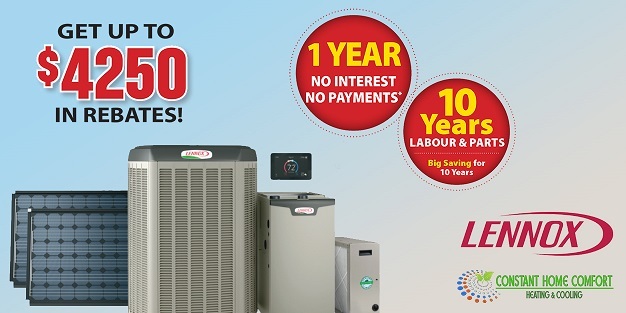 We offer air conditioners, water heaters, air filters and gas furnaces to residents in Toronto and the surrounding area, all at one great price. We also offer a wide variety of grants and rebates that are offered by the government and utility companies to save you money. We will file everything on your behalf so no need to worry! Plus, our energy efficient products bring your utility costs down, so you save on a monthly basis too! We understand that having any sort of problem with your heating and cooling system is a big inconvenience to you, so at Constant Home Comfort we address service calls and installation services urgently. We work timely, but efficiently so you can return to your day-to-day life. Our service technicians are always on call, day or night. They are ready to respond to any of your emergency situations. We service all forced air furnaces including mid or high efficiency. A priority at Constant Home Comfort is the use of high quality and energy efficient materials. We do not believe in cutting corners, so you can take comfort in our use of high-quality materials and our workmanship. We pride ourselves in taking the risks out of the products we install in your home. Our customers are our focus. We focus on what is important to you and keep improving to deliver an even better customer experience. We work together, with our customers to figure out the best solution to assist them in maximizing their savings and comfort. Lennox offers a wide range of reliable, high-quality A/C and furnace systems that can provide you optimal comfort. Constant Home Comfort is committed to helping you choose the right high efficiency Lennox furnace for you, install your Lennox furnace, remove the old furnace, and provide you with a complete rebates program to ensure you get the highest return. We also have financing plans with 0% interest for up to a year. Need a new A/C or furnace? Looking for a quick, all inclusive price over the phone? Call us now at 1 (888) 675-5907. We’re available 24/7! With Lennox cooling and heating systems, you may be eligible for up to $4,250 in rebates! Over and above our competitive prices, Constant Home Comfort will give you features and services that other HVAC companies and installers will charge for. See for yourself. If you are on the look-out for a new HVAC system, call us today for learn about the great deals we offer on Lennox air conditioners & furnaces! Fast installation. Great service. Free quotes.Give us a call anytime and one of our representatives will provide you with details and a competitive quote for your system of choice. We’ll beat the price of competitors while altering the features and services to fit your needs.In addition to great service, we offer extensive rebates that are already included in the price quote we give you. There is no other place in the GTA that offers such deals! Call us today. We will also dispose your old unit for no extra charge!At Comfort Home Care, we provide same day services with a warranty. We do this because we stand behind our services; we get it right on our first visit!Call 1 (888) 675-5907 for great prices and rebates for Lennox AC or furnaces in the GTA ! Based in Richardson, Texas, Lennox offers many top of the line innovative systems that help provide cooler, warmer, drier, cleaner and more comfortable environments. The units are designed to be energy efficient and quiet. Lennox provides HVAC equipment for residential and commercial properties. For over 125 years, Lennox has provided innovative and reliable cooling and heating systems. Lennox offers a wide variety of indoor home comfort systems that are among the most quietest and most efficient systems in the current market. Highly rated by existing customers, Lennox aims to provide the best services along with their high quality, energy saving products. In order to provide the best services and products for their clients, Lennox provides a great warranty coverage to ensure the customers are getting what they deserve. Why Choose Constant Home Comfort for Your Lennox Products? Here at Constant Home Comfort, we offer quick, reliable and cost-effective service. Our professionally trained HVAC specialists work at your convenience to ensure that your new Lennox HVAC product is installed on your schedule. We are available 24/7 to answer any questions and concerns you may have regarding your new device. Don’t forget to ask us about our rebates in Toronto and surrounding areas. We service Toronto, Etobicoke, Scarborough, North York, Markham, Vaughan, Richmond Hill, Aurora, Newmarket, Ajax, Oshawa, Oakville, Burlington, Hamilton, Mississauga, Brampton, Milton and more! Call Constant Home Comfort today at 1 (888) 675-5907 to find out more about your next Lennox A/C or Furnace unit! There are many furnace brands to choose from. How do they compare? What features do the different models come with? What features are the most important? I have my Air Conditioning installed by this company, the technician so nice , I was so happy for what they done for me! Great service from Constant Home Comfort for my house foam insulation in July 2018 , temperature in my house feels comfortable after they have done the job, highly recommended ! To Cary and his team I would love to recommend your company to all my friends, the speed in which you came to replace our furnace is amazing, although I was told by the installers I called there are no rebates, you have been able to get me the rebates and lower my cost significantly. I had an excellent experience with Constant Home Comfort. From the first phone call to constant home comfort, to the sales appointment all the way until the end of the installation process, i was completely impressed. Not only professionally, but friendliness and courtesy, which is very important to me. I have had bad experiences with HVAC companies before, but felt secure after the first phone call. I had replaced my furnace and a/c unit and Constant Home Comfort was able to save me more money than I initially thought, and they handled the paperwork for the rebates for me… made the process SO much less of a hassle on my end. Thanks guys! The process was amazing and customer service is extraordinary. I bought a new air condition unit from Ally at Constant. Their service and workmanship was excellent. The tech -Alex took his time to complete the job.